MicroGroup, part of TE Connectivity, offers all methods of passivating per ASTM A967. The Nitric II passivation line offers an auto-titrated nitric acid bath with triple cascading deionized water rinse. MicroGroup also offers acid neutralization using sodium hydroxide upon request. In-house testing for passivation is performed by ASTM A967 Practice D – Copper Sulfate Test, as well as by Practice E – Potassium Ferricyanide-Nitric Acid. 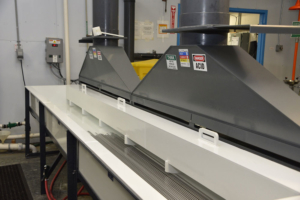 MicroGroup also utilizes the Koslow electronic passivation test. Additional testing requirements are available by partnership with local analytical laboratories.